On Wednesday afternoon Michigan DL coach, Greg Mattison was asked to recall his first impressions of DJ Durkin. The two first met in '03 when Durkin was hired as a graduate assistant for the Notre Dame team that Mattison worked as defensive line coach on. Mattison admitted that at the time of the hire thirteen years ago, he had no idea who Durkin was, but smiled and said, "He was there about a week and you knew you had a real one." A clear case of real recognizing real. And speaking of real, Michigan will be the first real powerhouse football team that Durkin's faced in his first year at the helm of the Maryland program; losing badly to a Penn State team that UofM beat 49-10, and barely beating a UCF team that the Wolverines smoked 51-14. For Jim Harbaugh and Co., this will be their biggest challenge as far as Xs and Os go since the Wisconsin game. Seeing as Durkin is the only coach in college football who's been 'down in the submarine' with Harbaugh and is no longer in the fold, some definite obstacles in preparation arise. So let's break those down. A lot of what We'll see from Maryland on the defensive side of the ball is going to look extremely familiar for obvious reasons, but it's going to look insanely familiar to Harbaugh. Not only was Durkin his DC last season, but Durkin's DC, Andy Buh, (also in his first season at Maryland) worked on Harbaugh's staff at Stanford as a linebackers coach and co-DC. So real recognizing real might be the theme going into this game from a coaching standpoint. This is going to be an aggressive, fast paced game right from the get go. The question is does Maryland's defense have the personnel and depth to keep up with the wealth of weaponry that Michigan has on offense. Some players to keep your eye on Saturday for this Maryland defense are linebacker, Shane Cockerille, who leads the team in tackles with 73, defensive lineman, Jesse Aniebonam (32 tackles, 8.5 TFLs, 5.5 sacks) and a solid secondary unit in Will Likely, Alvin Hill and JC Jackson. I think this defense will be able to keep the game close for a quarter with the chess match that will be taking place between sidelines. But in the end, Michigan's offense will wear them down with the run game, allowing for Wilton Speight and the Wolverine receivers to have huge second halves. 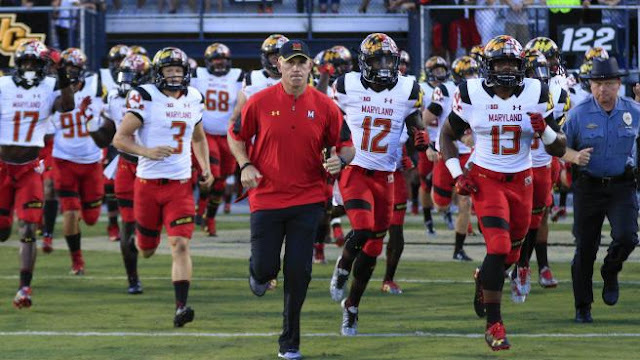 It's no secret that Maryland's going to be bringing a high-tempo, run heavy offense to the Big House. What is somewhat of a secret is their relatively unknown offensive coordinator, Walt Bell. Like Durkin, Bell is early in his coaching career, with stops at Arkansas State (OC previous two seasons) and North Carolina (TEs coach), where he was helpful in cultivating the talents of a player with whom many football fans in the state of Michigan would be familiar: Eric Ebron. Bell's break-neck offense lead by senior quarterback, Perry Hills, is probably the easiest style of offensive scheme to run if you're looking to maximize the output of average to subpar personnel. Often yielding teams points early in games, with significant drop offs after opposing defenses have time to make the proper adjustments. This Terrapin offense appears to be no exception to that theory, scoring 154 points in the first half on the season, compared to just 94 in second halves. Running backs, Ty Johnson and Lorenzo Harrison have put up solid numbers this season, but I think that's mostly due to the excessive amount of respect most opposing defenses have shown to the feet of Perry Hills. If Michigan's front seven can focus in on shutting down Johnson and Harrison, and force Perry Hills to run or pass the ball, it will be tough sledding against this stout Michigan defense which will be far and away the best that Maryland's faced all season. Michigan offense I think we'll be seeing a considerable amount of the playbook that hasn't been seen yet. The first quarter (maybe even the first half) of this game should be fascinating to watch. Look for a lot of imagination to be used in the backfield. I'm sure we'll see some new plays designed for Eddie McDoom, along with more draw plays than usual. I also think we're going to see just as much of Jabrill Peppers on offense as we saw in the first half last week against MSU, maybe even more. I'm going to go out on a limb filled with salivating UofM fans and say that this is the game where we finally see Jabrill pass the ball!! This will be a good test for the Michigan offense tactically, but not much of a test physically as the game wears on. Michigan will move the ball with relative ease in the second half of this one. This is far from Michigan's first rodeo this season with a spread offense, and Maryland is far from the most formidable of the offenses on that list. If Durkin wasn't so well versed in Harbaugh's gameplan, I'd say that they'd have trouble picking up much more than 200 yards of total offense on the Wolverine's elite defense. That being said, the ace in the hole that Michigan does possess that could nullify any insider knowledge that Durkin has is, Don Brown. Though Brown does have a very similar defensive philosophy to Durkin, they don't have quite the same approch. Brown is a very difficult DC to prepare for, adding new looks seemingly every week. I think that the way Brown uses his superior personnel tomorrow will keep the Terrapin offense off-balance all game. 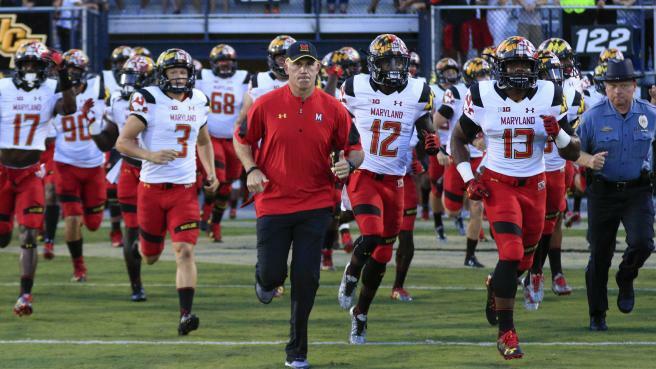 Maryland has allowed 716 kickoff return yards on the season. Don't be at all surprised to see somebody take one all the way back.